This pomegranate dark chocolate bites recipe is ridiculously simple, but I'd feel guilty if I kept it all to myself. We are talking three very simple ingredients, minimal prep time, and maximum flavor. Pomegranate + Dark Chocolate + Sea Salt + 5 to 8 minutes of your time = FABULOUS LITTLE TREATS! I basically put pomegranate into everything possible. It's bright, tastes great, and adds a dash of drama to any dish. Once, I insisted a catering manager at an event I attended call the chef so I could tell him that I thought that putting pomegranate seeds and mint into a simple fattoush salad was inspired. I really do appreciate good food at events (it can often be so blah) and anytime anyone adds pomegranate I feel I've found a kindred spirit...but I realize now that calling the chef may have been slight overkill. But only slight! I'd recommend using a high-quality dark chocolate for this easy, little recipe. 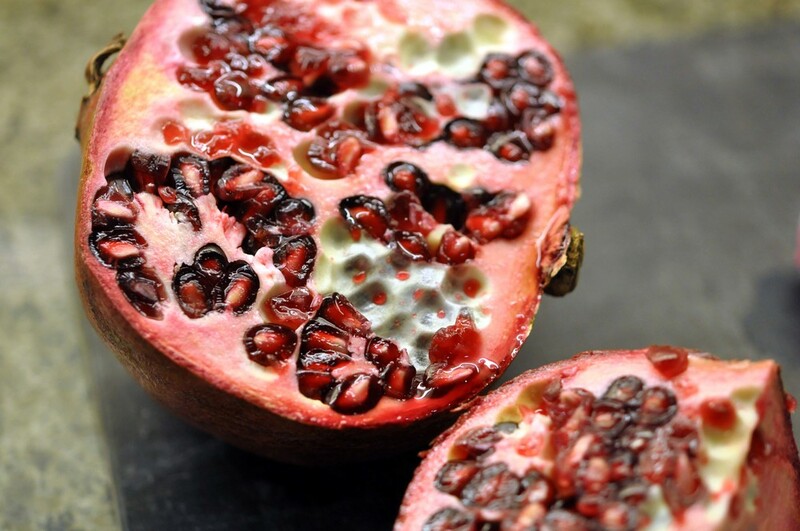 Pomegranates are in season, in the Northern Hemisphere, September to February (Aussies, sorry, you have to wait until March). So, this little treat would make a great Valentine's Day gift - as opposed to a foil wrapped (delicious, but not-so-great-for-you) chocolate heart. We respect your privacy and will NEVER sell your email! I used a Nordic Ware muffin pan for this recipes as well as this Lindt dark chocolate bar. I use Nordic Ware almost exclusively for all my baking pans and cookie sheets - they’re great quality, durable, and affordable. These pomegranate dark chocolate bites are ridiculously simple! Across 12 muffin cups, sprinkle a single layer of pomegranate seeds. Add the melted dark chocolate to a piping bag or plastic bag. Snip off the end, so a small stream of chocolate can come out. Pipe a crisscross pattern of chocolate across the pomegranate seeds. Add another layer of pomegranate seeds, then more chocolate, and then the last layer of pomegranate seeds. Finish with a pinch of sea salt on each of the pomegranate chocolate bites. Refrigerate for at least one hour before serving. After removing from the fridge, serve immediately.